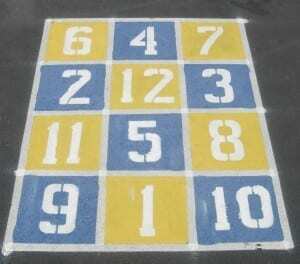 PEP Grant funds provides letter and number grids to Moorpark Schools as part of Peaceful Playgrounds Program. Moorpark kids are learning how to keep the peace on the playground, one conflict at a time thanks to new PEP Grant. The Peaceful Playground program, which was instituted as a joint effort between district coordinators for the Carol M. White Physical Education Program (PEP) Grant and the federal School Counseling Program grant, is designed to maximize physical activity and enhance learning during play times. Leslie Seifert-De Los Santos, PEP Grant project director for MUSD, said the program consists of various new, positive blacktop activities and games designed to keep kids busy during recess— ultimately reducing the opportunity for conflict. Last December, MUSD received about $900,000 in PEP grant funds to enhance physical education in the K-5 curriculum. The grant was part of first lady Michelle Obama’s “Let’s Move!” initiative, which is aimed at addressing childhood obesity across the nation. Last school year, grant coordinators used some of the money to purchase the Game Day P.E. program, which provides a structured physical education regimen, on-site teacher training and a nutritional education curriculum.